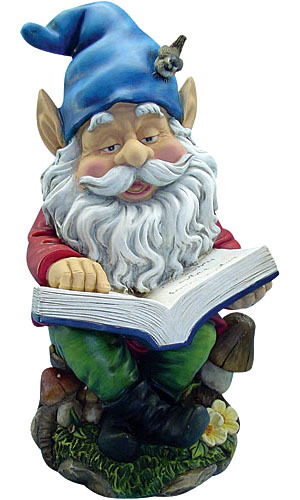 Colorful and serene, our garden gnome reading a book is the perfect inspiration to curl up with and read. This reading gnome sits on a small patch of grass with toadstools and flowers at his feet, engrossed in an engaging story. This garden gnome reading a book is a wonderful gift for the bookworms in your life, or perhaps to help encourage children to stop playing video games and pick up a good book. His 14-inch size is ideal for just about anywhere � next to your favorite tree, in your garden or even indoors in a family room or private library. Our yard gnomes, like our reading gnome, are made from durable cast stone resin and are weather resistant, so they can be outside in any season. At GardenFun, there are many possibilities for indoor and outdoor decor. With a wide selection of garden gnomes, sale prices and guaranteed customer satisfaction, what's not to love?